Gobblers Gold Video Slot Guide & Review - Casino Answers! Gobblers Gold is a 5-reel, 20-line video slot developed by Rival, featuring a wild symbol, multipliers, a free spins feature and a bonus game. You can play the Gobblers Gold video slot at Bovada. Coin sizes on the Gobblers Gold video slot are $0.01, $0.05, $0.10 and $0.25. You can select from 1-20 lines per spin and play from 1-10 coins per payline. You can bet as little as a penny per spin on the Gobblers Gold video slot all the way up to $50 per spin. This is a great betting range for casual players and high rollers should be happy with it as well. There is an autoplay mode available for real money players only. To play the Gobblers Gold video slot, you can either hit “Bet Max” to play all 20 lines at 10 coins per line or you can hit the “Spin” button. The highest paying symbol on the Gobblers Gold slot game is the Wild Turkey symbol. 5 Wild Turkey symbols on a selected payline will pay out the 7500 coin top jackpot. The Wild Turkey symbol is wild and will substitute for all symbols except for the Mayflower and Pilgrim Man symbols. 1, 2, 3 or 4 Turkey symbols substituting in winning combinations will also multiply your winnings by 2X, 3X, 4X or 5X. The next highest paying symbol on the Gobblers Gold slot machine is the Pilgrim Lady symbol (up to 1500 coins). If you hit 3, 4 or 5 Pilgrim symbols anywhere on the reels of the Gobblers Gold online slot machine, you will win 10, 20 or 100 free spins respectively with a 3X multiplier. You can win lots of cash with triple winnings when you hit the free spins feature on Gobblers Gold at Bovada! All wins multiplied by the bet per line, except for scatters. All wins pay left to right except for scatters (which pay any). Only the highest win is paid per selected payline. Bonus wins are added to payline wins. Gobblers Gold has a good top payout, a bonus game, free spins with a high multiplier and also a nice looking cartoon-style presentation. 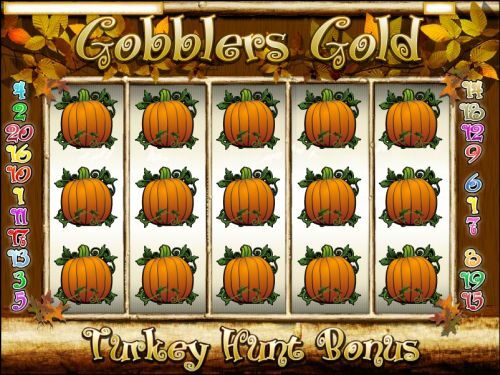 To play the Gobblers Gold Thanksgiving slot game, you can sign up and make a deposit at Bovada! 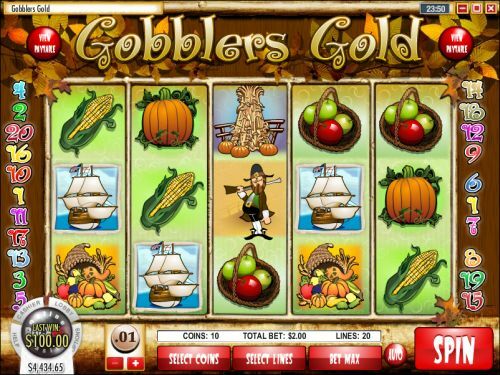 Are players from the United States able to play the Gobblers Gold online slot? Where can I play a free Gobblers Gold Flash game? You can play an Instant Play version of Gobblers Gold with no download required at Bovada. You can play for free or play for real money. If you experience any difficulties with the Flash Instant Play casino software, make sure you have the newest version of Adobe Flash Player.